Passing the ASVAB test is your first step to joining the military. Your ASVAB scores are what determines whether you are eligible to enlist as well as the type of jobs you qualify for. As you’ve probably heard, getting a great score on your ASVAB test is important if you want a job that pays well. Don’t we all? If you are confused about what your score means, don’t worry – you’re not alone. The ASVAB test is taken by over one million military applicants, high school, and post-secondary students each year. 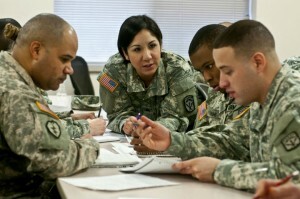 ASVAB stands for Armed Services Vocational Aptitude Battery. But what does that actually mean? Armed Services means a country’s military forces, including its Army, Navy, and Air Force. Vocational means your occupation or job. Aptitude means your ability to do something. Battery means a series of questions. There are 10 different multiple choice tests you must take in order to complete the ASVAB. These tests include questions on many topics to help gauge your knowledge needed to complete daily military duties. However, only four of these tests are used to determine whether you have a passing ASVAB score. Your scores on the Word Knowledge (WK), Paragraph Comprehension (PC), Arithmetic Reasoning (AR), and Mathematics Knowledge (MK) tests are what determines whether you pass the ASVAB test. Note: These four tests are called the Armed Forces Qualification Test (AFQT) which determines whether you can enlist in the military. Scores on the AFQT range from 1-99. This score actually represents how well you performed in comparison to the other test takers. A Standard score of 50 means you scored in the top 50 percent of all test takers. How do you calculate your AFQT score? If you are looking at your ASVAB practice test scores you might be wondering how to calculate your AFQT score. This score is calculated by combining your Word Knowledge (WK), Paragraph Comprehension (PC), Arithmetic Reasoning (AR), and Mathematics Knowledge (MK) test scores. Unfortunately, your AFQT score can only be calculated by the test administrators. That’s because each question in the ASVAB test is given a unique number of points. When you receive your ASVAB scores, you will only be shown the number of questions you answered correctly, instead of your raw score. As you can see ASVAB and AFQT scores can be complicated. The most important point to take away from this article is that you need an AFQT score of 31 with a high school diploma or 50 with a GED to enlist in the Army. Remember, those are the minimum requirements. A higher score can help you qualify for better paying jobs in the Armed Services. In fact, it is recommended that members of the Armed Services retake the ASVAB even after they enlist to improve their scores. If you have questions about your ASVAB score please let me know and I will update this article with the information you need.